One of the things that I really wanted to do in Shenzhen aside from sightseeing was to visit a factory where they produce electronics. Quickly I found out that factories in general are not too eager on letting in nosy people, asking questions or certainly not taking pictures. Aside from the sometimes not so comfortable working circumstances in the factories they’re also dealing with product information that should be kept highly secret due to the fierce competition. Not one of my emails requesting an interview and a tour of the factory received a reply. Maybe it was because the people did not understand English or because they just didn’t want to. But just as they say ‘many ways lead to Rome’, I tried a different approach. After contacting some acquaintances they were able to pull some strings and arrange a visit to a relative small mobile phone factory around 30km outside of Shenzhen half way up a big mountain. As promised I’m not going to mention any names or the location of the factory so from now on I’ll call him mister X from factory Y. Before describing my visit, first a few facts about Shenzhen to gain a better understanding of the city and its context. 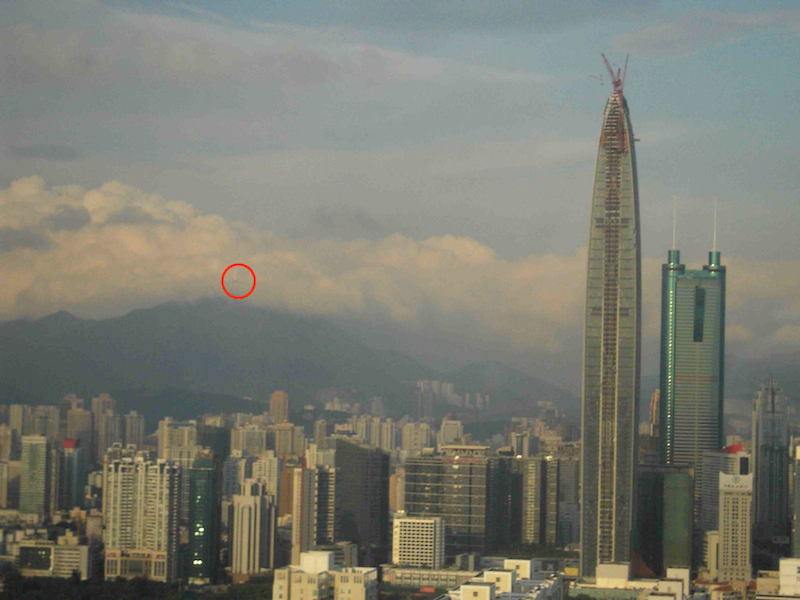 The city is located in the south of China in the Guangdong province, immediately north of Hong Kong. It was China’s first and some argue the most successful Special Economic Zone. Until the late 1970s Shenzhen was a small village until Chinese and foreign nationals invested enormous amounts of money in the economy. It grew into the third busiest container port in China, after Shanghai and Hong Kong housing the headquarters of numerous high-tech companies. Because of the booming economy young people from all regions of China move here to look for a job or start their own business. A lot of people get into the mobile phone business, either manufacturing or selling. Some work in factories, others repairs old cell phones for reselling. With some investment money other entrepreneurs start their own company offering their own collection of new cell phones. Mister X agreed to my visit to his factory and also invited me over for dinner to get a full experience of factory life. Unfortunately the appointment was in the evening, when most of the workers already returned to their dorms. Maybe Mister X planned it this way so that his workers wouldn’t be distracted by my presence. When arriving in the factory canteen the cook was asked to separately make a few dishes for us whereas most of the workers had already eaten. On the wall I noticed shelves that held everyone’s personal bowl and pair of chopsticks in happy colors. There was also a little corner shop that sold alcoholic and non-alcoholic beverages, snacks, instant noodles and basic daily products. I learned that the factory had around 80 workers at the moment, both male and female ranging from age 20 until 25. The factory used to have up to 120 workers but due to the bad business climate Mister X had to let some of them go because there was no work. 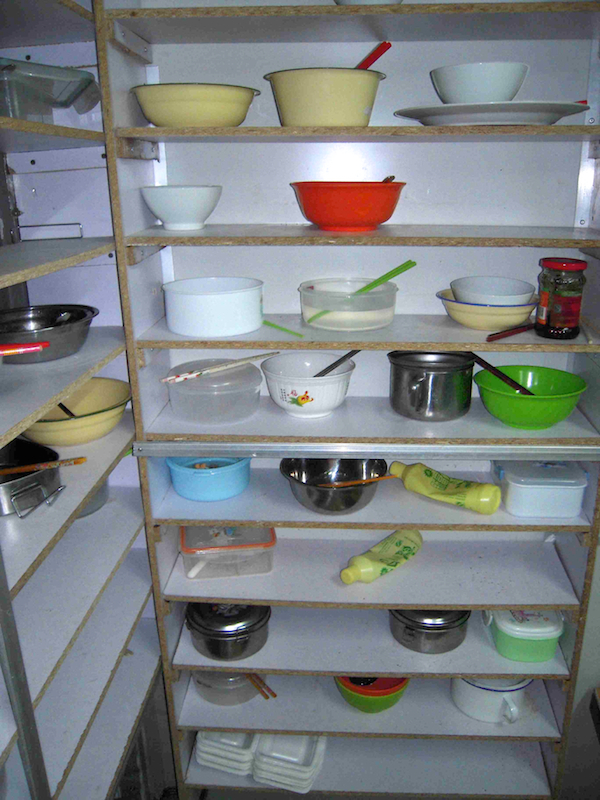 The workers earned around 2000 RMB a month, around 210 Euro, which included food and dorm room. The workweek lasts from Monday until Saturday and aside from Sunday’s the workers also get national holidays off. Mister X explained that the current business climate for mobile phones wasn’t very good due to the competition from larger factories as well as sole proprietors. After a tasty dinner one of the workers was called down to take me on a tour of the building. The guy was aged 23 and very friendly, he showed me around the different spaces in the factory allowing me to take pictures. 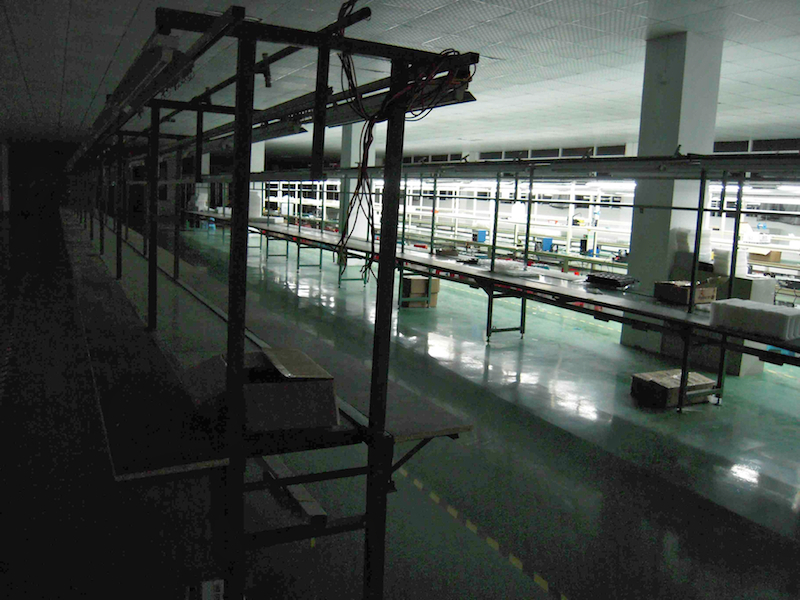 First he showed the manufacturing hall with long rows of tables, wooden chairs and fluorescent tubes. There were still a handful of workers busy with finishing the daily chores. All kinds of hardware parts were lying around from the smallest screws to displays and batteries. The tools used were mainly screwdrivers, soldering irons and a few computers to program software. Next came the stockroom where all the different parts were neatly sorted and divided into boxes, including instruction booklets and packaging material. Although inside the building it was a little smelly it didn’t look very filthy. I was told that the floor was swept and mopped everyday to provide a hygienic work and living environment. I asked if it was also possible to take a look inside the dorms and the guy took me down one level and showed me their living condition. Guys and girls had separate rooms on the same floor. The hallway was full of laundry and on the floor there was a lot of food wrappings and empty bottles lying around. My guide apologized for the messiness and asked me if he should let the workers tidy their rooms before I took a picture. I told him this wasn’t necessary because I wanted to get an idea of how the workers really lived. The dorms were small and contained five bunk beds allowing maximum ten people. Most of the dorms had 9 people living in them leaving 1 bed as storage room. In the middle of the row of beds was a narrow walking space. Some of the girls’ rooms were decorated with colorful posters of famous people I didn’t recognize and some girls were watching a movie on a laptop. The men dorms were pretty plain and stuffed with dirty laundry. I caught one girl lying in bed with a guy at the dorm room and when she saw me she giggled shyly and disappeared under the blanket. 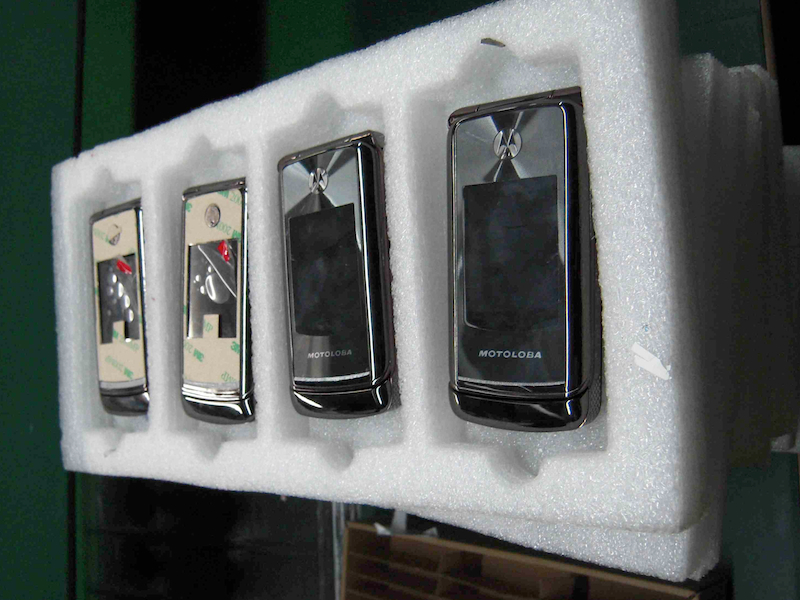 As I inspected the phones that were almost finished I saw the brands were Motorola and Nokia. After taking a closer look I realized that these were Shanzhai phones, rip-offs named with a slight misspelling of the original brand, like Motoloba and Nokla. Shenzhen is infamous of these kinds of electronics and the term Shanzhai is used for these fake versions of international brands. According to the dictionary Shanzhai can mean two things; a fenced place in the forest or villages in the mountain that have stockade houses. The use of the term comes from Cantonese slang in which ‘shanzhai factory’ means an ill-equipped, low-end factory. Nowadays as a large portion of Shanzhai factories don’t deliver poor-quality products anymore, they still carry a fake brand and the bad reputation. A reason to go Shanzhai is to route around the governments difficult regulations to become an official cell phone manufacturer. Companies try to operate under the radar and avoiding the hassle. Gradually ‘Shenzhen products’ became ‘Shanzhai products’ because they sound the same when people speak Mandarin with a Cantonese accent. Although manufacturing Shanzhai products is not legal the government tends to tolerate it because it helps develop the economy. This does not mean that there are no inspections, that’s why these kinds of business don’t operate too openly. An entrepreneur in Shenzhen, who just started his own Shanzhai mobile phone company explained the ins and outs of this market branch. The process of manufacturing a Shanzhai device starts with the choosing a design of the mobile phone from an image, this is already a difficult job because you have to know what sells, what models fit consumer taste. After picking the model molds have to be made for the production together with a dummy version that only shows the outside, this takes about a week. Then you take it to a factory to find out if it’s possible to fit all of your requirements into the device you designed. The essential question is: can it be made? This can take up to 20 days. Because all of these tasks are outsourced a returning element is negotiating the price, it is hard to agree on a good price because everyone wants to make as much money as they can. If the production price in negotiated, the contracting party first has to use his own investment money to pay all the parts and the production costs. First a small amount is ordered, around 500 devices, if there are no defects found more are ordered. The total process from picking the design until receiving the end products takes up about two months. There are many different parties involved in producing a mobile phone whereas some factories also outsource work they can’t do themselves. Being in the Shanzhai business is all about speed, making the length of production time as short as possible. Where the international brands are focused on quality and service, Shanzhai is about selling as many as possible before the model goes out of fashion. Most of these devices can’t be used outside of China because they can only operate on the Chinese network. A lot of the Shanzhai phones are sold in less developed cities because the people there do not have the money to purchase international brands. It is hard to pinpoint which mobile phone will become successful because the popularity of features and appearance can vary per region or city. But overall it can be said that rural areas like devices with a high volume, good reception, bright screens and long battery life. It is hard to make a lot of money from Shanzhai phones. The entrepreneur tells that on an average he makes 8 RMB profit per device (0,83 Euro), which seems like little money for all the hassle and uncertainties of the business. Loving these peeks into China life. And actually surprised at the wages you mention — thought workers made a lot less! Curious: how/where are these employees sourced from? Are they generally satisfied with their work opportunities at these types of factories? nice post! this is worth a documentary! did it change the way you view your iphone4? knowing that it could have been manufactured in a similar setting such as the one you describe? @ Ekatarina, the employees are sourced in different ways. Sometimes there will be adds in the newspaper or radio, other ones are introduced by agencies. I’m not sure how you want to define satisfied but in general I think that this specific factory has pretty good conditions, this is def not the case everywhere. The way I see it though is that factory workers are never really satisfied because it’s not a kind of job they want to do for the rest of their lives. They’re always looking out for better positions and payment as in the end everyone wants to make as much money as possible. Most (if not all) of the workers in this factory move on after a few years, thats’s why the maximum age is around 25. @ Emina, if you find this topic interesting there is a book which very well describes this kind of living and working in Shenzhen. It’s called Factory Girls from Leslie T. Chang. I’m not really sure if it changed my view about my iPhone because in a way all of us know that the goods we purchase might not be produced without sweat and tears. Maybe I’m a little insensitive but this is also the case with food we eat and clothes we wear. It did surprise me that most of the parts were put together by hand rather than by a machine. But I guess a machine would require a lot of investment money so that might be to risky.